Google is definitely on the way to release the Google Nexus 5 as they have suddenly and drastically dropped the price of the Google Nexus 4 in the US, UK, Canada, France, Germany, Spain and Korea. The Google Nexus 4 price has been cut off by $100 in the US. The smartphone was previously available for $299 which is now available at $199 for the 8GB model and $249 for the 16GB model. 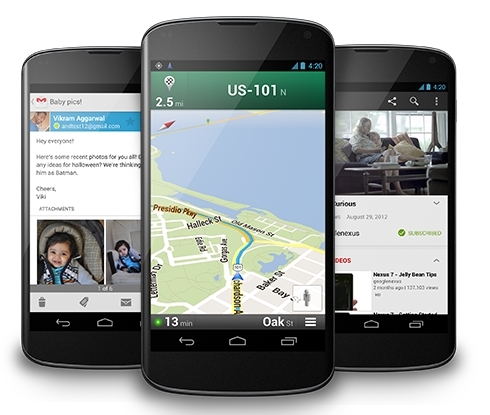 Nexus 4 features a 4.7 inch HD display with a resolution of 1280 x 768 pixels. It is powered by Qualcomm Snapdragon S4 Pro processor with a clock speed of 1.5GHz. Some of other specifications on the Google Nexus 4 include 2GB of RAM and a choice of 8GB or 16GB of built in storage. The handset also features 8 megapixel rear camera for video recording and 1.3 megapixel front facing camera for video calling. It has Android 4.2 Jelly Bean availability. However the only major drawback of this smartphone is that it doesn’t support 4G LTE data speed as it is at times likely to rival the speeds of home Internet service. This is the major area where Nexus 4 lags behind. But just at $200, the slower data speed should not matter.